Peak horizontal acceleration at each station is contoured in units of percent-g (where g = acceleration due to the force of gravity = 981 cm/s/s). The peak values of the vertical components are not used in the construction of the maps because they are, on average, lower than the horizontal amplitudes and ground motion prediciton equations used to fill in data gaps between stations are based on peak horizontal amplitudes. The contour interval varies greatly and is based on the maximum recorded value over the network for each event. Small unfilled circles, shown on some maps, are points where strong motion values were estimated and used to fill gaps in the station distribution. a) Red triangles are stations from the Caltech/USGS digital telemetered network. b) Blue triangles represent California Geological Survey (CGS) and California Strong Motion Instrumentation Program (CSMIP) dial-up stations. c) Yellow triangles represent stations from the ANZA Regional Network. For moderate to large events, the pattern of peak ground acceleration is typically quite complicated, with extreme variability over distances of a few km. 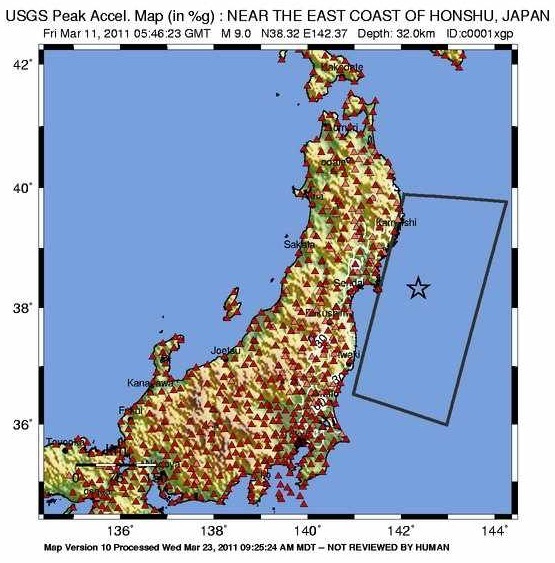 This is attributed to the small scale geological differences near the sites that can significantly change the high-frequency acceleration amplitude and waveform character. Although distance to the causative fault clearly dominates the pattern, there are often exceptions, due to local focussing and amplification. This makes interpolation of ground motions at one site to a nearby neighbor somewhat risky. Peak acceleration pattern usually reflects what is felt from low levels of shaking up to to moderate levels of damage.